The stake body truck can be one of the most versatile trucks in your fleet, carrying all the equipment you would need for your company’s operations. Are you getting the most out of your stake truck, though? Read on to learn about several features you should consider looking for in your next stake body truck purchase, or as additions to the current stake trucks in your fleet! If you plan on carrying large amounts of equipment to and from your operations, adding racks to your stake body truck is essential. 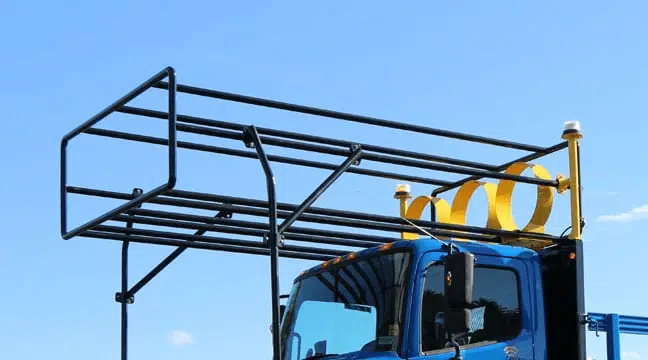 Having heavy duty steel racks on your stake truck will prevent the items you are transporting from falling off the bed of the truck during transport. This ensures that all of your equipment being transported will arrive at your job site, thus saving you time by guaranteeing that all your equipment will arrive in a single trip. The standard height for the racks is 36”, measured from the bed of the truck to the top of the rack. If you plan to stack equipment higher than the standard racks allow for, there is also the option for extended height racks. These racks measure in at 48”, giving you an additional foot of coverage. Another feature to look for in a stake body truck is a non-skid deck. When looking at the bed of the truck, the deck should be coated in a non-skid paint. This rough coating not only prevents the stored equipment from shifting on the deck during transport, but it also gives additional traction for workers when they walk on the deck. If the truck’s deck was smooth, workers would have little to no traction on it, especially in inclement weather. While this may seem insignificant, a non-skid deck is an extremely useful safety feature. 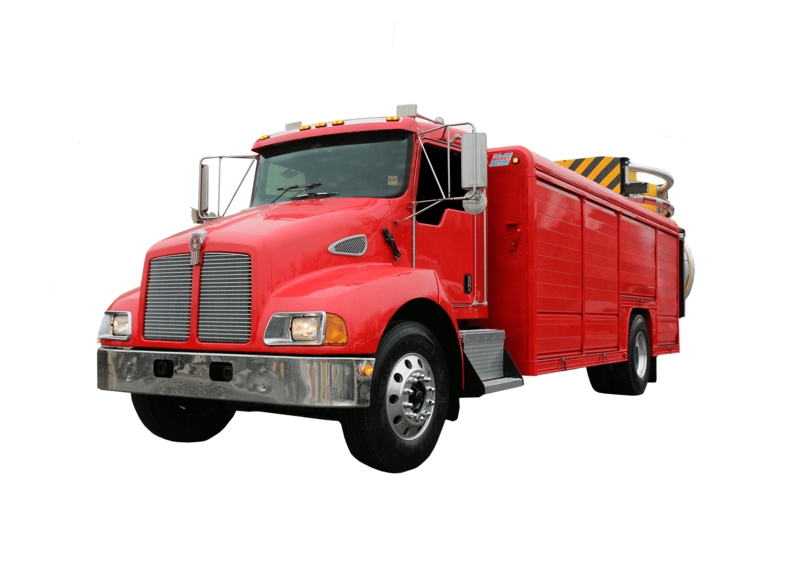 Only you know what exactly your operations entail and what your trucks need to do to assist in making your jobs successful. Here are several more add-on features that can make your operations run more efficiently. If your operations require traffic barrels or drums, the addition of a barrel rack, otherwise know as a drum rack, provides a secure storage space for them while also freeing up space on the bed of the truck. This system, which is mounted over the cab of the truck, can store up to 60 traffic barrels. Inserting and retrieving barrels from the rack is incredibly simple and can be done in a short period of time. This also frees up space on the deck of your truck, allowing you more space to transport and store additional pieces of equipment. 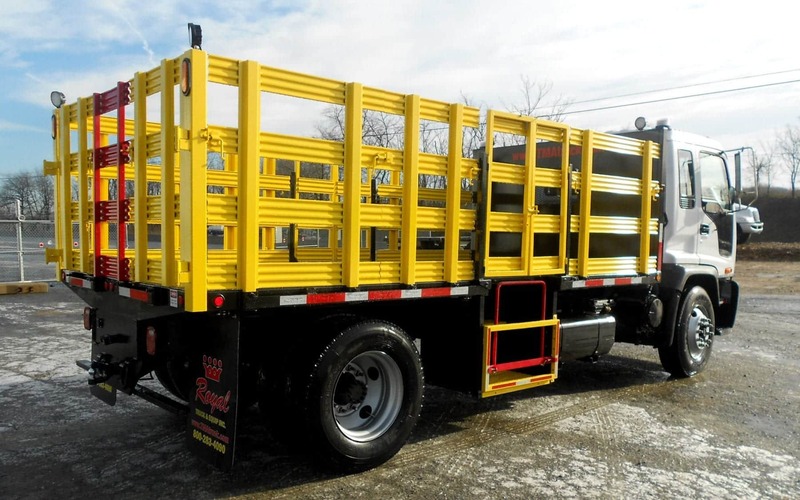 An additional safety feature to consider adding to your stake truck is a lift gate. A side lift gate on your truck has several major benefits in helping your jobs run efficiently, but perhaps the most important benefit is that it helps keep your workers healthy. Watch the above video to see a side lift gate operate in action. A side lift gate can minimize the amount of lifting your workers need to do, thus reducing the likelihood of a back injury. Keeping your workers healthy will ensure that your operations will continue on successfully and run without significant down time. With productivity being as important as it is, a side lift gate may be the most beneficial add on for your stake truck. Do your operations require tools that you cannot store on the deck? If you are consistently bringing small tools to your job sites, adding tool boxes to your stake body truck may be a good option for you. The tool boxes, which can be mounted directly below the bed of the truck, provide a storage option for tools you may need at the job site. The tool boxes also have the capability of being locked, which allows you to securely store tools you may need without the worry of them being stolen. While stake body trucks are versatile in what they can carry, there are still many operations they are not suited to complete. If your stake body truck is sitting around for large portions of the year, your company is losing money. Did you know that it is estimated that construction equipment is, on average, only 30% utilized? This means that the truck sits idle in your yard 70% of the time! If your company does several different kinds of operations, purchasing a 3-in-1 truck is a better option for you. 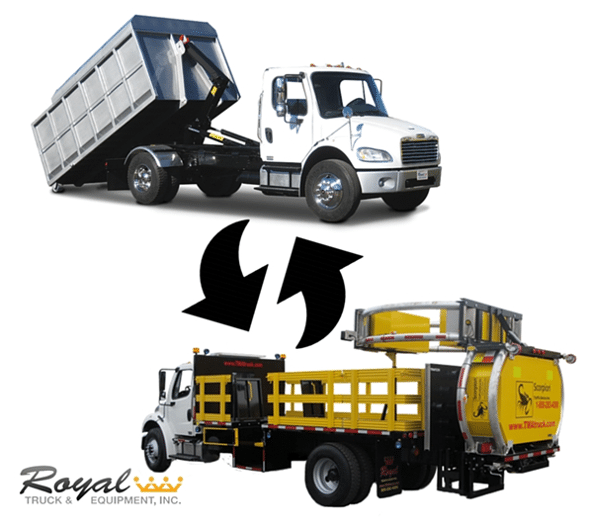 A 3-in-1 truck can be transformed into three separate builds: a TMA truck, a traffic control truck, and a stake body truck. This transformation can be done in a matter of minutes, meaning that you can go from job to job with one truck without significant down time. This also ensures that your truck is utilized significantly more often than it otherwise would be. Why should you need to purchase three trucks to do three separate operations when one truck can do the work of three? Watch the 3-in-1 truck being quickly transformed into three separate trucks: a TMA truck, a traffic control truck, and stake body truck. A stake body truck is anything but a one size fits all. While there are several safety features you should look for in every stake truck, there are many add-ons that can uniquely benefit your company and its operations. If your company does several different types of operations though, a 3-in-1 truck may be a better truck for you. As a 3-in-1 truck can be used in many different kinds of operations, it can save your company money by increasing your fleet’s utilization rate. How much is that truck in the first image above?